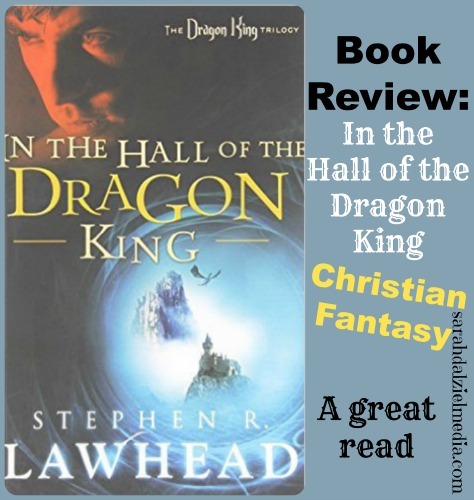 Steven Lawhead is one of the prolific versions of Christian Fantasy writers, with several fascinating Christian fantasy series. My personal favorite, and the one which introduced me to Lawhead’s writing and style, is the Dragon King trilogy and specifically book one, In the Hall of the Dragon King. The story begins with an acolyte, peacefully living in a temple to a heathen god, but knowing that something in his life is about to change. Within 24 hours, he is out of the temple and riding to bring news of a shocking incident to the queen’s ears, the king has been kidnapped! The story is fast paced, and well-crafted. Quentin, the acolyte, goes from not even knowing how to take care of his horse, to performing valiant deeds of courage and rescue. The other characters in the story, Theido (the Hawk), the Hermit, Queen Alinea herself, and the dark skinned and dark eyed Toli who can find food and shelter in the worst forest in the kingdom, not to mention the good knight Rolando who manages to escape death several times. Of course, a character list would not be complete without the foes, the Necromancer a main villain who is trying to create a force of dead from the best fighters that world has known. And Prince Jaspine, a spineless and power hungry royal pup who wants the Dragon King’s throne but is fully under the Necromancer’s thumb. When all seems lost, the loyal forces beleaguered, and Quentin lost in the woods. Will the Most High who Quentin has heard so much about come through? Or will the serpent’s grasp remain strong, and all hope be forever lost? I enjoy the sharp contrast between the power of the Most High, and the non-existant power of the old gods/old way. The action is consistent, and builds steadily to the climax. At the same time, every one of the characters is engaging and interesting, and you may just find yourself rooting for the outlaws, rather than the soldiers! I like that, in the end, when all the battles are over and (spoiler) the Dragon King is restored to his throne, that clemency and justice are blended. While the chief offender is dead and gone, those who were deceived by him are given a surprising level of clemency, even Prince Jaspine. Of course, the fun thing is how the Dragon King, in his hall of course, rewards the little hero of the story. An unassuming acolyte, who is given the greatest reward a king could bestow – son-ship. Hmm, king returning to his own, a usurper being punished, and the orphan adopted as the son… does that remind you of anything? The only possible disappointment in “In the Hall of the Dragon King” is that there are actually no dragons. And in all honesty, dragons would have been super helpful in book two in this trilogy. While I greatly enjoy reading book one and book two in this series, I do not find book three half as enjoyable as the others. Books one and two have a great deal of action, fights, battles, and the like. Book three has more intrigue, drama, and suspense, and personally I prefer cutting suspense with a sword to trying to unravel it. However, if you want an interesting Christian fantasy read, I would highly recommend “In the Hall of the Dragon King.” This book, of the three, is the most suitable for a younger audience. I read it for the first time when I was 11 or 12, but adults can (and will) enjoy it just as much or more, than younger readers. Since I have also re-read it a few times, 4 I think, it is well worth adding to your reading collection. Do you have a favorite Christian Fantasy author? Is there a Christian Fantasy book you would like to see reviewed here? Leave a comment! I enjoy hearing from you!